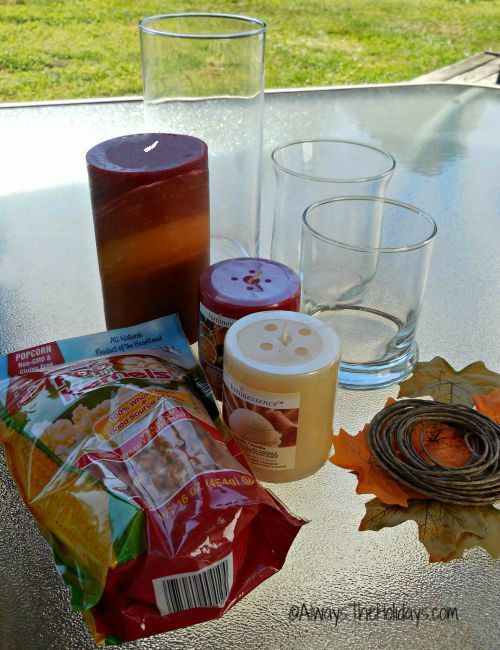 This Easy DIY Fall Hurricane Popcorn Table Decoration Makes the Table Ready in a Flash. I love decorating in the autumn. Supplies are plentiful, right in the garden outside and the colors are so warm and vibrant. 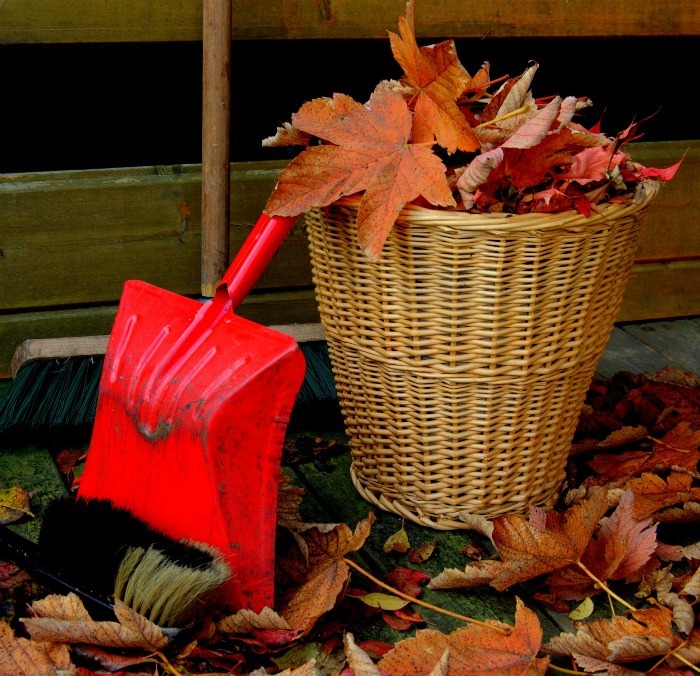 What could be easier than taking a walk outside and picking up fall leaves. They are rich with color and the variety is fabulous. And, in my house at least, I use more popcorn for crafts than I do for eating, so I always have a bag of it somewhere. It is colorful, whimsical and keeps well in a decorative piece. Plus, the colors of it are just right for autumn decorating. 3 pillar candles just a bit smaller than the width of the holders. Any colors will do. I used complimentary colors. 4 Silk leaves in autumn colors. Real leaves would work fine too but would get brittle if the display is left too long. The table decoration is super easy to make. Basically, it’s just pouring, tying leaves and using something to add height. Start by pouring some popcorn in the bottom of the glass holders. Measure to make the candles as near to the top as you would like them. Then place the silk leaves on the candles and tie with a piece of the jute. I used one leaf for the smaller candles and two for the larger one. 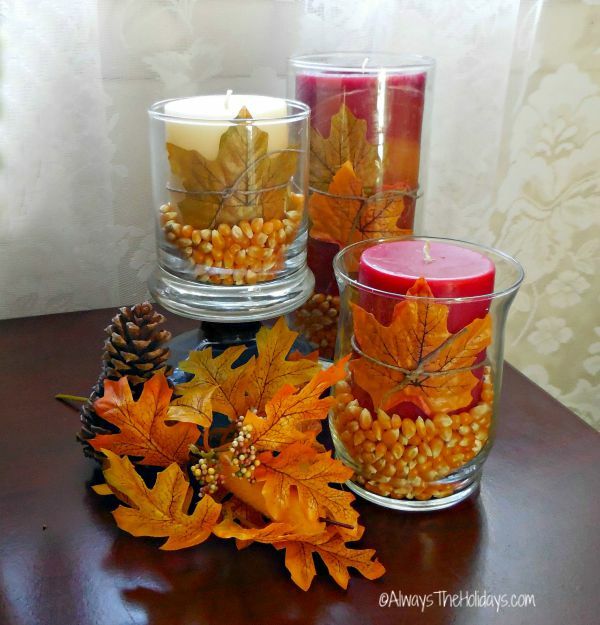 Slip the candles down into the glass jars and pour a little bit more popcorn around the base of each candle. Arrange the candles in a pleasing decoration. I used an up turned glass bowl to give me the middle height since I had two smaller glasses of a similar size. 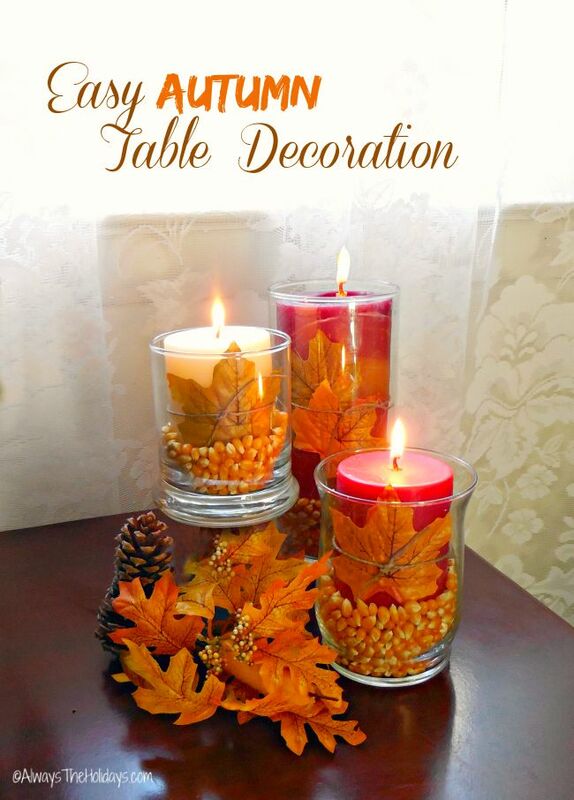 Place the autumn pick or loose autumn leaves and pinecones at the base of the decoration. The popcorn table decoration would look great on a dining table, an occasional table or even a mantle. 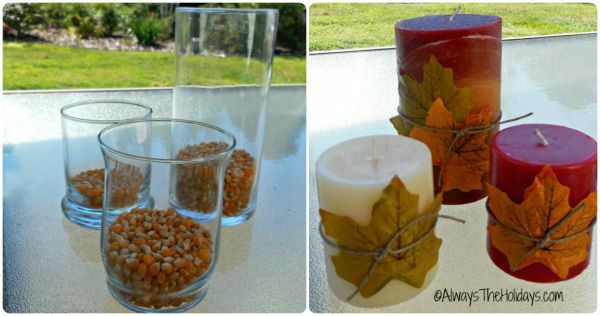 The candles can be used alone or in groups to create a centerpiece effect. Easy peasy, very inexpensive if you use supplies on hand or from the Dollar store, and yet it looks very effective. The inspiration for this project came from a similar one on Amanda Jane Brown. Be sure to visit her website to see other DIY projects.